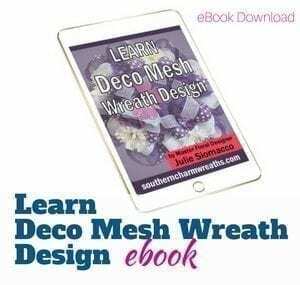 Determine where you want to place the Styrofoam and secure floral wire using a staple gun under where the Styrofoam will go. Note: Cut the wire longer than the Styrofoam so you can wrap it up around it. Add a bit of hot glue over the staples to ensure the wire stays in place. Note: To ensure hot glue strings do not get onto the star, you could choose to cover the part of the star that is not being decorated with a plastic bag or foil while you hot glue. Otherwise those hot glue strings can get everywhere! Cover the sides and top of the Styrofoam with moss using floral pins. Add a bit of hot glue to the bottom of the Styrofoam and place it over the wire on the star. Bring the wire up around the Styrofoam, twist it and cut off any excess wire. Next, create your bow and add a pick to it for easy attachment to the Styrofoam. Note: I made the tail of the bow 11 inches long and the bow loops 8 inches. 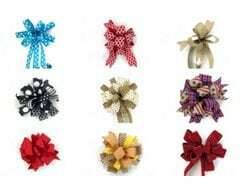 For help in creating your bow, check out my website for a great free tutorial. Add the bow to the Styrofoam. I added mine to the bottom and angled it a bit. Begin adding the flowers by pushing the flower stems into the Styrofoam. I began by adding red Gerber daisies and then added the others in groups of three. To ensure the flowers stay put, add a bit of hot glue to the stem before pushing it into the Styrofoam. Next, add greenery to fill in empty spaces and give it a finished look. Be sure you look at your project from every angle! Learn from my mistakes! I went a little wild and made my floral arrangement a bit too big for the star. I would recommend scaling the flowers back a bit so you can see more of the star. But don’t be afraid to try it for yourself! 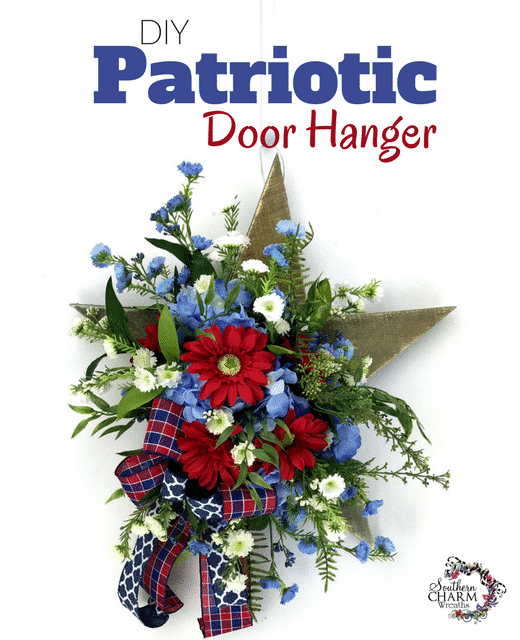 You could add a small flag to this or other small festive patriotic decorations. Visiting family or friends over the summer? 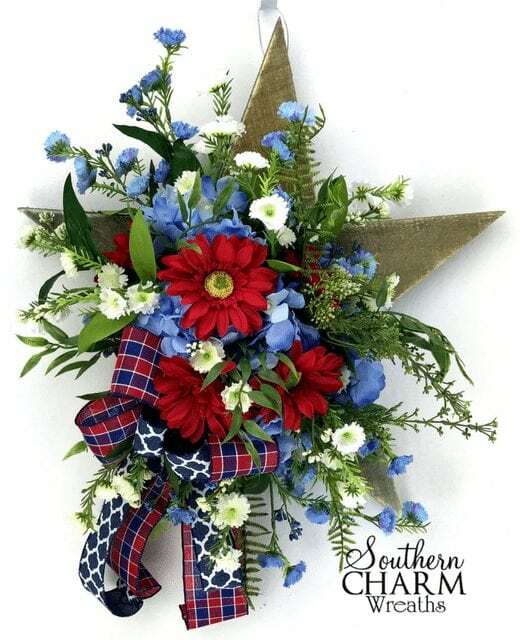 This would make a great hostess gift for your hosts front door! Let me know if you enjoyed this and don’t forget to join me on Facebook so you can watch me Live! 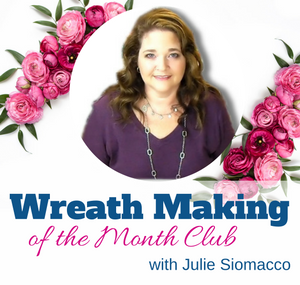 If you enjoy watching me and/or learning to make wreaths of various styles, you should consider joining my Wreath Making of the Month Club, learn more here. Beautiful ! Love it. I have learned so much from you. Bacause of you , I can make a bow now. You are a gift from god. I would love to see you make a spring / summer lantern swag. I truly enjoy learning from you. Summer lantern swag will be on the blog next week! 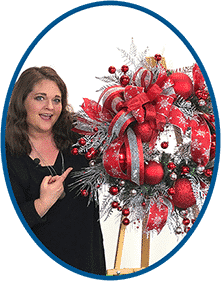 I went to Carolina Pottery to see if I could order the 20″ wooden star that u made the patriotic wreath on but had no luck. Do u know any other place I could order one? I purchased it in the store. I don’t know of another place yet. I will search. LOVE, LOVE, LOVE it. You are so amazing. God has truly gifted you with incredible creativity and talent. This is a beautiful wreath. I love it! Will this be a kit. 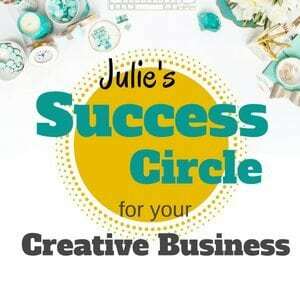 No, this is a free tutorial on my blog, not the membership portal.